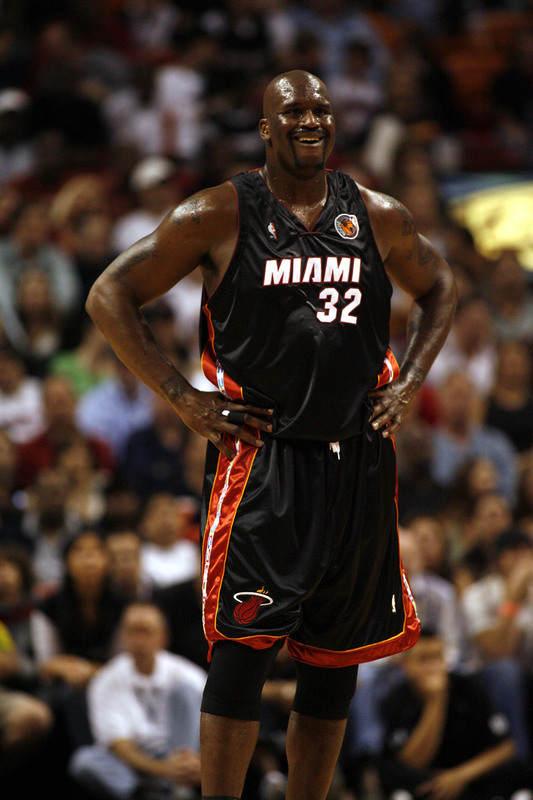 Here’s Shaq modeling the Heat’s special “Noche Latina” uniforms last night. Additional pics here, here, here, and here, and there’s a full explanation here. I think Jason Williams saw a ghost. Oklahoma State’s baseball team is wearing throwback uniforms this weekend, an improvement over their current uniforms, IMO. Nice uni’s for the Heat… but I have never been much of a fan. They have always looked like pajamas to me. The ‘pokes’ throwbacks look great. More colleges need to do this kind of thing. On a related note, I fear that as we see more ’70s and ’80s nostalgia throwbacks, teams will start to feel more comfortable with the pullovers and possibly start wearing them full time. That would be bad. Baseball jerseys need buttons. Here is the white version of those OSU throwbacks. And a comparison to some of the current uniforms. It is distressing to see the extent to which pajama bottoms have now invaded the college ranks. For a few years, I had hope that the pants-pulled-high look that prevailed in college would work its way up the Majors when those players reached that lofty level. Instead, the college players who wore high pants are going with the slacks when they turn pro, and the collegians who remain are turning to the PJs as well. The keys to the new Wembley Stadium in London where finally handed over from the builders to the Football Assosiation yesterday over a year late and millions over budget, however it does mean that it will be the likly venue for the Giants @ Dolphins Reguler season game next season ,so a word of advice for Giants management if they want to win at Wembley get the team to wear the Red Alternate jerseys assuming Miami as the home team choose white and not aqua, the most historican victorys in the old Wembley stadium came usually to a team wearing red for instance England over West Germany in 1966 wearing there red away shirts, Liverpool FC winning the 1978 European cup wearing there traditional red and there are many examples. The Philadelphia Phantoms (AHL)will be wearing these jerseys Friday night. The NBA really needs to tone down the “theme” nights. You’d think this was minor league hockey. I’m still not sure about the pants. If they keep the curved lightning bolt on the new white helmet, that will mean there are three different types of bolts on the unis. The numbers have moved up to the shoulders, from the sleeves. They will also be wearing a re-designed powder blue jersey for a couple of games. This makes me wonder if the throwback powder blues are now really a thing of the past. Also, the Memphis-Houston game is pretty good. Except Memphis has this horrible asymmetrical blue stripe up and down their uni. It’s quite annoying. Like those Heat unis- also never been much of a fan of those. Since we don’t have the NBA here (just the Warriors) I don’t really keep up with the NBA- but Shaq is one huge dude. No numbers on the chargers sides? ack! Are there any shots of the helmet? Looking at those Heat photos, this guy has ‘kichigai’, the Japanese word for ‘crazy’ (and a rude one at that) tattooed on his right arm. His facial expression only adds to it! font looks horrible, it doesn’t match. Did they use light blue on the numbers? I noticed a picture of Joe Maddon wearing a hoodie that said Tampa Bay Rays. I checked their MLB Shop and all of their current merchandise lacks the “Devil” name. I know there’s been plenty of talk about dropping it from the team name. Perhaps this is a step towards eliminating the “Devil”? funny that the nba wouldnt choose the Raptors to participate in noche latina (i realize theyre not on the coast) but with the amount of internationals on the team and the multicultural community it seems like it would be a good fit. also someone needs to tell jason williams he doesnt have to breathe that hard….its looks like hes going to inhale his own face. Like, oh my gawd, Shaq, I just bought the same leggings! We could so be twins! You should try wearing something pastel with them…it would minimize your hips a little better! Or maybe…you could try wearing actual shorts! nfl.com has an article on the new uni’s. Yes the numbers and the bolts are outlined in powder blue. The bolt outlined by both powder and navy. [quote comment=”59464″]nfl.com has an article on the new uni’s. Yes the numbers and the bolts are outlined in powder blue. The bolt outlined by both powder and navy. I disagree. I don’t like how having a button-up breaks up the script, especially when a player is batting. It just looks uneven and sloppy. Coach’s uniform newspaper piece (reg might be required). Sidney Lowe: stylin‘. Does anyone know where and/or when we can purchase the new MLB hats that are not the 100% wool they are going to use for the regular season? random question. i know theres been a lot of talk about modifying hats recently, and i was wondering if anyone knows a trick to permanently streching or enlarging a strectch-fit cap. its a L/XL and still too tight on my 7 5/8 head. I think I like the whites even better than the black pullovers. Even though orange is my second favorite color (green’s #1) I think in most cases it should be relegated to an accenting role. I wish I had enough $$ to spens on 87 custom suits…. You ever think he might be refering to some sort of new material or some new feature on the jersey that Reebok designed. So he considers it an honor the Chargers got it first instead of say the Colts or Pats. I don’t have any pics, but I prefer Lowe in the red jacket, and tie. The announcers of the VT NCST game saw Roy Williams in the stands, and wondered if NCST won, would Roy rock a powder blue jacket and tie for the ACC champ game. [quote comment=”59460″]funny that the nba wouldnt choose the Raptors to participate in noche latina (i realize theyre not on the coast) but with the amount of internationals on the team and the multicultural community it seems like it would be a good fit. “Noche Latina” would refer to Latin America as the flags show. I don’t believe the Raptors have any Latin American players on their roster. Possibly, but considering all the fanfare that RBK has made with the new hockey uniforms, you would think that there would be a bigger promotion if they do have some sort of new material, design, cut, etc. There’s not even a mention of anything like that in the article. I have to admit too that Rivers’ statement seems a bit odd. I have always been a fan of high school hockey unis and my favorite is in the finals tonigh of the Minnesota state tournament. The Grand Rapids Thunderhawks (aka the Halloween Machine). They are playing the Roseau Rams. I also like their unis. I’m pretty sure in the Sun on San Diego article (maybe I think?) they talked about the Chargers jerseys being the first of a new “elastic” jersey type. They claim it makes it harder to pull on the jersey to tackle them. Quoted for truth. Focus on the game, not on marketing. How often do you see an NFL theme night? Not true. They have been moving away from using Devil in the name for the past few years. You cannot find officially liscenced MLB products with the world Devil on it, just Rays. Unfortunate because it is stupid people are complaining that it says Devil in it, referring to an animal. Too many people didn’t like it, so they are most likely going to be just the “Rays” next year. Absolutley stupid if you ask me. They just invested millions into a tank full of sting rays, so that is how I know they will keep the Rays in the name, but most likely just drop the Devil. It pisses me off. Why isn’t Florida wearing their new unis in the SEC tournament. Photo from today. If you read the article it mentions that the numbers are on the shoulders on the jersey. jb, two excellent unis. I am rooting for Grand Rapids, and I agree that their unis are slightly better than Roseau’s. I like the Miami unis, but the red stripe is too shiny and wide. Also, the pics make me cringe because all I can see is Shaq dunking on two hapless Timberwolves players and Udonis Haslem shooting over a flat-footed Mike James while KG leans away from the action. did anyone catch the player in the A-10 final for GW who was missing the “GW” logo on his front neck? How did that happen? And: Has anyone pointed out that, aside from the experimentation with team jerseys, Oregon’s cheerleaders also wear unusual outfits made by Nike? Hey Paul, ever done a column on cheerleader uni’s? And-also curious about the Florida uni’s. Maybe they saw the others and came to their senses. Obviously hes referring “our team” to the 2007 edition of the Chargers, not the organization. He’s saying he’s honored the bringing in the new jerseys for this current/roster, rather then any Drew Brees or Doug Flutie led teams of the past. Think people, think. run those last two posts by me again. Just to follow up on yesterday’s posts on hard plastic backing on jersey patches, I got my weekly newsletter from Murf and Pat Denny, and it contained this tidbit. Here are two methods collectors have used with success. patch at all and is by far the best way to take off backings. “I’ve done dozens with 100% success”. These instructions are from an experienced collector. consuming process. I think the last one I did took about 20 minutes. Any way to edit my crappy use of tags by the way? That email was from Murfandpat.com, which you will be taken to if you click on the BIG old link in the post above. Close all tags, Jeff, close all tags. Sheesh. First- To stretch flexfit hats I like to put the hat on a slightly deflated volleyball, inflate it, and let the ball wear the hat for a day or so. It stretches the elastic nicely. Second- According the the manager of my local Lids, they have to wait until March 30th for the official launch of the new MLB hats. However, they had a Tigers one from the World Series and while it looks the same, the material is much smoother and the hat is much lighter. And if you are into white hats, they can actually make them white with the new material, not cream like the wool 5950s. 1. It was the last all-pullover shirt World Series. 2. It was the first time a team played in a World Series wearing red shoes. (Incidently, there have only been six other red shoes teams in the World Series (85 Cards, 87 Cards, 90 Reds, 93 Phillies, 04 Cards and 06 Cards). 3. It was one of only two World Series where both teams wore powder blue road uniforms. (The other was the 1980 Phillies/Royals series). Great shot of a tribute patch Hofstra Lacrosse players are wearing. Hopefully Florida did see how ridiculous those unis looked and aren’t going to break them out…especially the black ones (douchechills.) Hopefully the fact that they got slaughtered at Tenn when then wore them earlier in the season keeps them out of those things for superstition’s sake. [quote comment=”59530″]Great shot of a tribute patch Hofstra Lacrosse players are wearing. I had posted a few weeks ago when I saw the patch from afar, but I couldn’t read anything on it, but figured whom it was for. Here is a link to the ‘Military Tribute Night’ Manitoba Moose game. Pictures of their uniforms can be found at the bottom of the website. I’m not sure what that patch on the upper left hand side of their jersey is supposed to be though. Miami has the metallic white helmets already, so it’s nothing new. I know that your not a big College Basketball fan but know that the Tournement field is set can we get a bracket filled out by you based on the uniforms the teams wear. I think it might be a good article for Thursday.